Welcome to the gospel according to John the Baptist. Jesus’ arrival is mad good news for John. As he’s baptizing, he sees Jesus coming and says, “Behold, the Lamb of God who takes away the sin of the world!” (1:29). As a Jew speaking to Jews, John is making a reference to the Passover lamb, sacrificed every year to commemorate the Exodus. When God killed the firstborn of every Egyptian, he spared the Jews because of the sign of lamb’s blood that they applied to their doorposts. John uses the lamb as a metaphor for Jesus’ own sacrifice, suggesting that those who count on Jesus’ blood to cover them will be spared from God’s wrath. John the Baptist has been critical of both the ruling Roman state and his Jewish countrymen; he knows the world’s neck-deep in its own sin, so the news that Jesus will take away its sin is good news indeed. A few chapters later, John expounds further on Jesus’ importance. He refers to Jesus as the bridegroom, and as a friend of the bridegroom, John “rejoices greatly because of the bridegroom’s voice.” (3:29) He’s as happy as the best man at a wedding, and he doesn’t mind in the least that Jesus has begun baptizing and is drawing crowds. In John 3:36, he lays out the theological significance of Jesus’ sacrifice with no metaphors: “He who believes in the Son has eternal life; but he who does not obey the Son will not see life, but the wrath of God abides on him.” It’s remarkably prescient of him to understand Jesus as a sacrificial lamb long before Jesus had begun to attract ire from the Pharisees, let alone before he’d been crucified. In order to be spared from God’s judgment, a person has to trust in him and obey him, like an ancient Israelite obeying God’s command to paint their door frame with lamb’s blood and trusting that God will pass his house over. John sees the wrath of God hanging over mankind’s sinful head; he sees the ax at the root of the tree. The good news is that there’s a way out: mankind isn’t doomed. 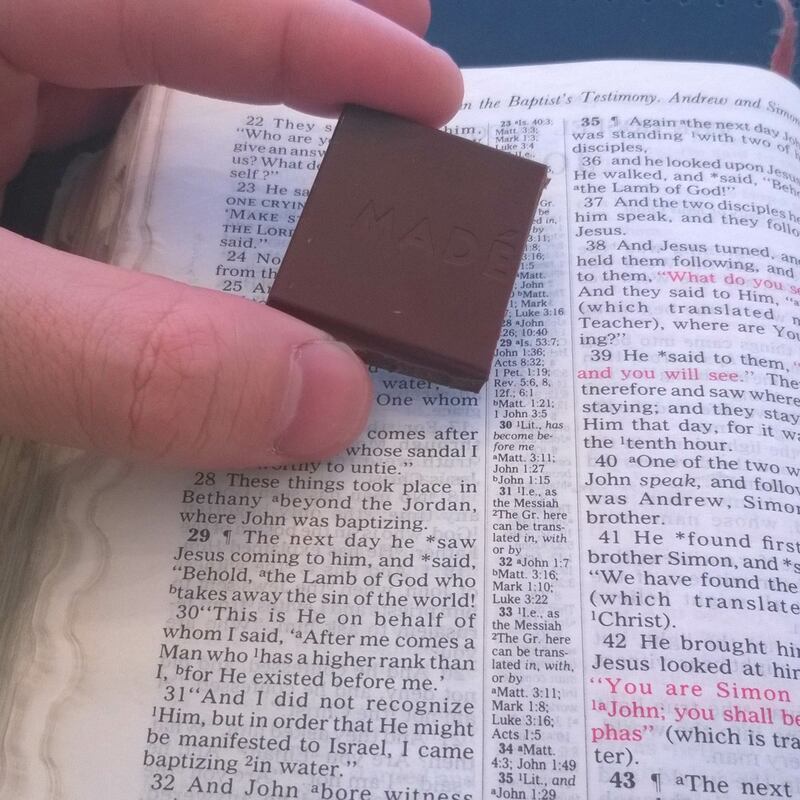 Today’s chocolate is a brand-new bar: Madécasse 70% cocoa dark chocolate! One of my favorites, it’s a sweet bar with a slightly fruity flavor and a kick to the finish. And I don’t just like it for the taste, either. 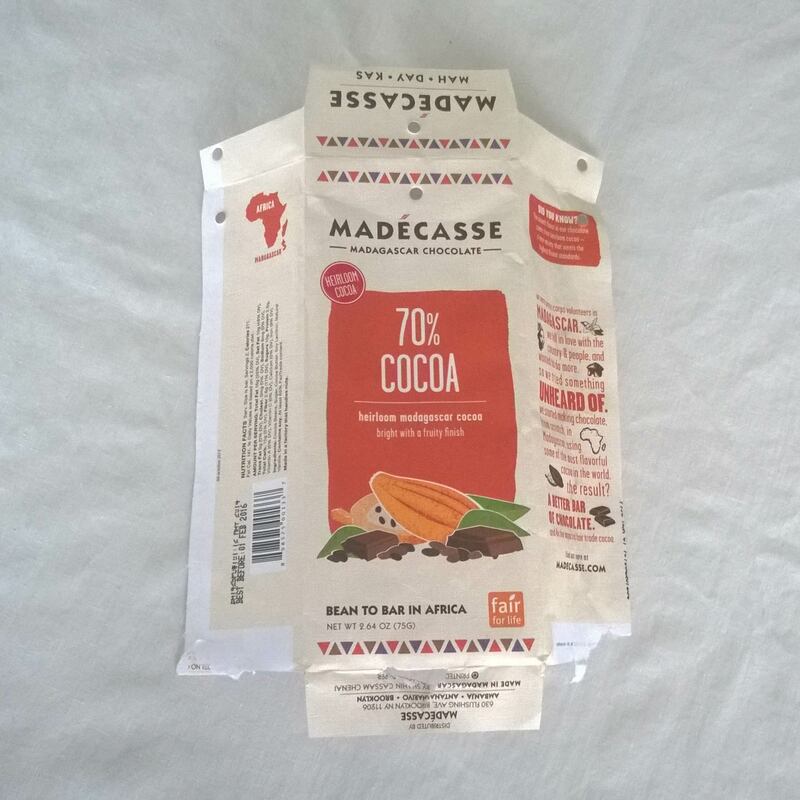 Madécasse’s fair-trade claim to fame is that it manufactures over 90% of its chocolate bean-to-bar in Madagascar, so that Madagascar-native cacao farmers, chocolate manufacturers, and packaging producers all reap increased profits from the process. I’ve got some good things to say about it (and a few others!) on this blog’s Slavery-Free Chocolate page, so check it out. Posted in John, The Gospel, Topical Studies.Tagged atonement, bible, christianity, gospel, Jesus, John, John the Baptist, sacrifice, scripture, sin.